Valentines Day is just around the corner! I thought it would be fun to recycle some of our old Valentines Day Hairstyles and maybe throw in a few new dos from now until Valentines Day. 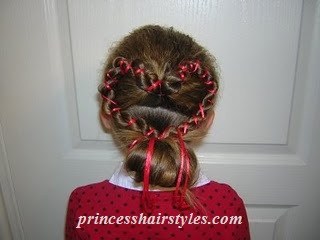 Here's a heart hairdo post from 2008. A heart with ribbons! The instructions aren't great on this one (it's old) but it's one of our favorites. Start by making a half pony. (I went further down on her head than I normally would.) Split the half pony into 2 sections and braid each section. I did rope braids, you can do whatever you like. Make another pony with the rest of her hair at the bottom. 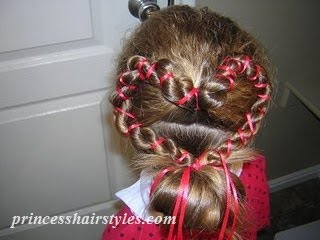 Take one of the braids and lay it over her head forming half the heart. Secure the end in with the lower pony. Now you can start on the ribbon. Tie one end onto the elastic. Take a needle and thread the other end through. 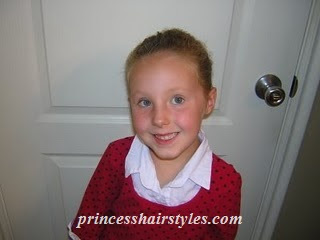 Start "sewing" the braid right onto her hair. 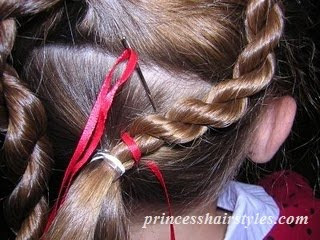 Take the ribbon over the top of the braid, then pull it underneath, grabbing as much hair underneath as you can. When you get to the end of the first braid, just grab the other braid and keep going, forming the rest of the heart. (The ribbon is actually what holds the braid to her head, so make it kinda tight.) And, it probably doesn't even need to be said, but.......BE CAREFUL WITH THAT NEEDLE!!! (Or use a plastic one.) When you get back to the bottom with the other braid, tie the end into the elastic. You can finish this however you want. We did a messy bun. I actually crimped the top of her hair before starting this, just to give it a little more texture. Sooooo cute! The princess is so little in this picture :) Adorable. Thank you so much for posting so many awesome hairdos. My daughter and I have had a blast trying them all out (some with more success than others! ).